Quality, technology, design and sustainability. Four brand values that illustrate GROHE''s commitment to creating exceptional experiences. The highest standards are set to ensure that every time you turn on a GROHE faucet or step into a GROHE shower you can feel the difference. 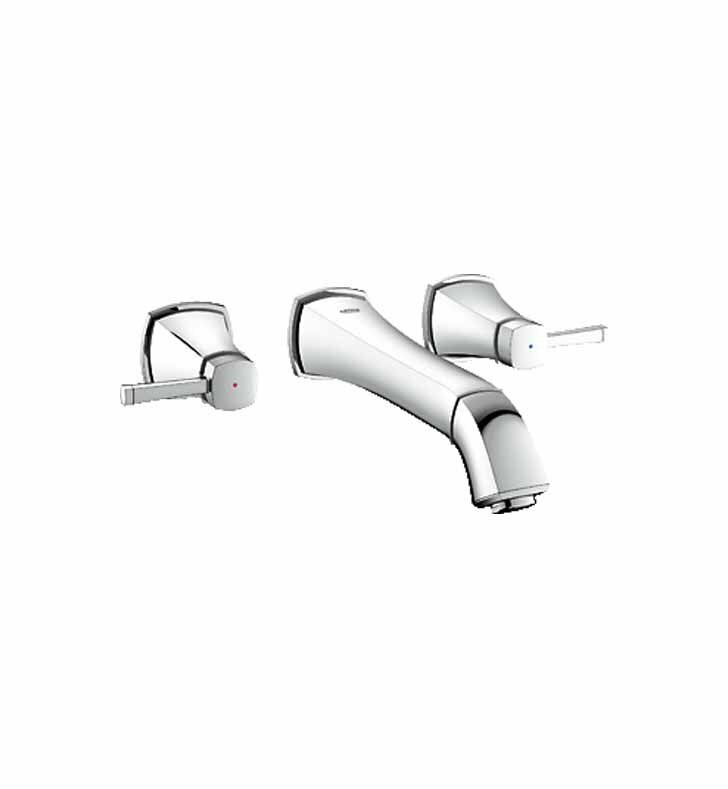 Grandera, 3-Hole Wall Mount Vessel Trim, 9 1/4" Spout Reach, ChormeThe GROHE Grandera™ collection is both a homage to an age of grandeur long past and an affirmation of a modern sensibility, combining the highest standards of quality and craftsmanship with a love of detail and comfort. Stylistically, the Grandera™ collection can be combined with a wide range of bathroom furnishings, with the added flexibility of two colours – chrome and chrome/gold. Thanks to GROHE StarLight® technology, not only will the fittings retain their shine in the long term but they are also extremely resistant to dirt and scratches. GROHE faucets are renowned for their smooth operation. Not only are GROHE one of the world ‘s leading faucet manufacturers, but we are also one of a very few manufacturers that produce their own cartridges. A cut above the rest, in house cartridges are at the heart of GROHE SilkMove® innovation. These cartridges utilise the most advanced ceramic alloy technology coated with a special Teflon lubricant, which guarantee rich smooth handling. A faucet is used many times a day, everyday, however GROHE faucets withstand years and years of use whilst delivering the same outstanding performance, every time. GROHE EcoJoy® reflects our commitment to the environment and is already included in a number of established products, such as our thermostats, dual flush sanitary systems or electronic faucets. Now, the smart, sophisticated designs of selected single-lever mixers and showers have been made even smarter. These new products feature integrated water-saving technologies that restrict flow rates, allowing you to reduce water consumption without sacrificing on performance or design. The result is less environmental impact and reduced running costs. H 2 3/8" x W 13" x D 9 1/4"